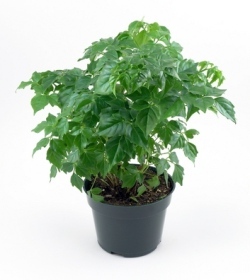 China Doll plant is fairly new as a house plant. Introduced to garden centers in the 1980s, it quickly became popular because of its tolerance to the warm, dry air of heated homes. It's still in favor -- and it's easy to see why. Lush, emerald-green canopy of leaves cover this tropical beauty year-round. If you're adding one to your collection (and you should) look for plants with stems that are covered with leaves from top to bottom. Skip a leggy plant -- a sure sign of neglect. Don't be afraid to buy a small plant, this one grows fast. A small, evergreen shrub, it has long, bipinnate leaves with glossy, deeply veined leaflets that are about 2 in (5 cm) long. Young plants are compact with branching, woody stems. Fast-growing, this plant will quickly become leggy if not pruned back. Pruning china doll will keep the plant compact and beautiful. Cut off as much as you need to in spring and summer. Pruning tip: Always prune above a leaf node (the place where a leaf is attached to the main stem). Use sharp pruning shears to avoid tearing the woody stems. Also, pinch off growing tips regularly to encourage the stems to branch out. In its native habitat of subtropical Southeast Asia, mature plants will produce fragrant, yellow bell-shaped flowers. But plants grown indoors rarely flower. The keys to success with this China Doll house plant are plenty of bright, indirect light and consistantly moist soil. Yellowing leaves usually mean it has been overwatered. Repot in spring, only when its roots have filled the pot. Use a container with drainage holes to prevent soggy soil. Water: Keep soil evenly moist year-round. Don't allow the soil to become soggy -- or dry out. Either condition will cause the plant to drop its leaves. Yellow leaves are a symptom of overwatering. Humidity: Try to maintain 40-50% relative humidity around your plant. Mist your plant to increase humidity, or use a humidity tray. Temperature: Average room temperatures 65-75°F/18-24°C. It will tolerate a minimum of 50°F/10°C. Propagation: Take 4 in (10 cm) stem tip cuttings in spring or summer.